Life, Doctor Who & Combom: Doctor Who Stars Matt Smith and Karen Gillan go incognito in London. Doctor Who Stars Matt Smith and Karen Gillan go incognito in London. 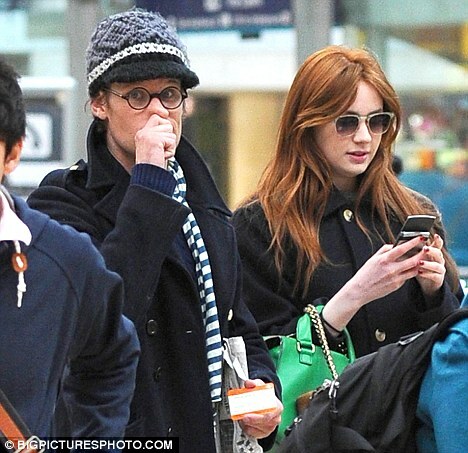 Doctor Who Stars Matt Smith and Karen Gillan went incognito while in London the other day. They bared all disguises to avoid alot of attention from press and fans as they boarded a train which is speculated to have been heading to Cardiff, ready for filming of Series 7. Karen went for the old school girl look, while Matt Smith went eccentric and decided to go aka Wheres Wally? style. To see the whole article and more photos click here. If Karen wants to go incognito she should hide her amazing hair.